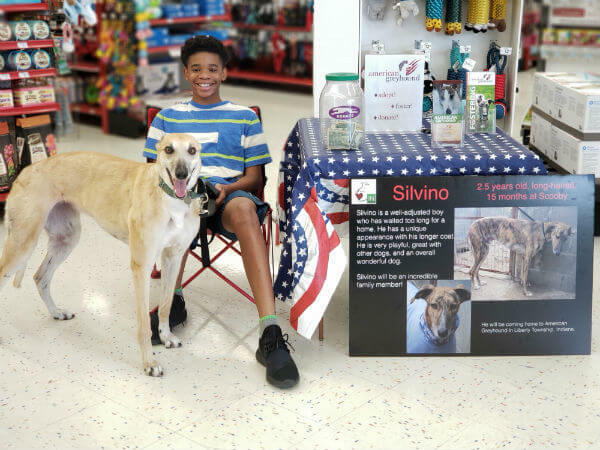 So far, my family has fostered 15 dogs on behalf of American Greyhound (AG). This includes retired racing greyhounds, galgos, lurchers and one owner surrender returned through no fault of the dog. After researching this wonderful breed and their characteristics, unique history, pedigree and lifestyle, we specifically got involved with AG to foster retired racing greyhounds. We wanted to be part of the journey of these amazing athletes retiring to become amazing pets. Since becoming a part of this group, we have also met many other sight hounds, and we have welcomed them into our home as well. Every 10 weeks, there is a haul of newly retired racers coming from Birmingham, AL to Coldwater, MI. These dogs take part in an obedience training program with the inmates at the prison in Coldwater, called The Greyhound Inmate Experience (TGIE). “Parole” day is always such a good experience and I try to be there whenever I can. The first time we meet these dogs, they are newly retired athletes. The second time we meet these dogs, they are pets. Each graduate of the program comes with a beautifully decorated bag of goodies, an obedience certificate and a folder filled with lots of helpful information on how they did in the program. I have toured a racing kennel, race track and adoption center in Wheeling, WV. I have met dedicated trainers, loving kennel hands and lots and lots of racing greyhounds. I have participated in long distance road trips to help AG haul greyhounds heading straight from a track or farm to waiting foster and adoptive homes. My dogs have represented AG with us at picnics, parades and special events, and we also help coordinate adoption events for AG at local pet stores. 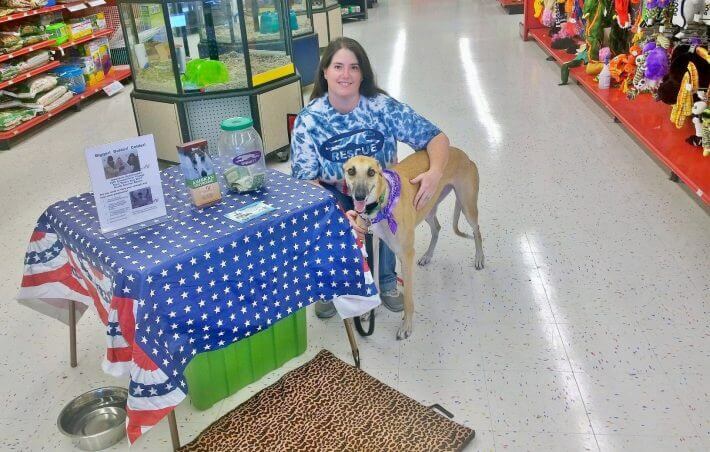 We like to educate the public about greyhounds and AG- although we do not have to do much besides answer a few questions, because people fall in love with the dogs after spending a few minutes with them. We enjoy having the foster dogs in our home. Fostering is also a great experience for our own pets. Our cat has tested many dogs and our own dogs enjoy having a job, they are essential to helping us show foster dogs how to follow our rules and how to live in our home. It takes very little effort for most fosters to adjust to home life and our pack always adapts quickly. It is so fun getting to know each foster dog’s personality and traits. It is not easy for any of us to say goodbye to our fosters, but we know every time we foster, it means another dog will find their forever home. The brief pain of losing them is far outweighed by the joy of having them. When our foster is adopted, we know the journey for that one dog is now complete, but there are many others still on their journey.